(Ghana)—Members of a ministry based in Ghana are fighting more than poverty, illiteracy and illness. A spiritual battle against discouragement rose to a new level when evangelistic success brought threats of persecution. "It has been tough and discouraging these days, but we are still dependent on Him," the director of the ministry said. Along with health, water, education and micro-enterprise development programs, the ministry has been showing "The Jesus Film" in villages, and not without opposition. 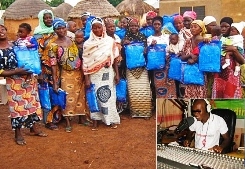 The organization complements the screenings and other evangelistic efforts with broadcasts from its radio station. It reaches 2 million listeners with a wide range of community service programming, such as agricultural advice, besides its Christian programming. The director considered closing the radio station, however, as it could not keep up with costs and repairs: the transmitter developed serious problems; air conditioners in the transmitter room faltered; the radio mast was 50 meters short; there were persistent problems with the studio console, and a consultant concluded that reception was poor among many listeners. 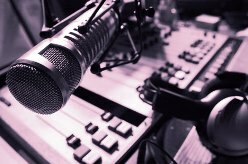 "Wages were low, and the morale of the radio staff was so low that some staff members resigned," he said. "Should we close the radio station down? Should we reduce the radio staff even more? With more than 90 percent of the 1 million folks in the metropolis and its surrounding villages being Muslims, it has become increasingly difficult to sell airtime to run the station." Income remained the same, as expenditures continually rose, he added. "We have huge electricity bills, as the tariff was increased more than 80 percent," he said. "We prayed and prayed for God's intervention. We needed the Lord to do something for us to see He is still with us." One afternoon the radio station received a call from an imam at a village mosque about 25 miles away. He told a station staff member that after listening to the broadcast for a little more than a month, he and eight of his followers had given their lives to Christ. Their conversion to Christianity, the imam added, had caused Muslims in a nearby village to come and beat them, as well as destroy some of their properties. "It was a great disgrace to the communities to have a leader of a mosque turn to Christ," the ministry director said. "This is an unpardonable sin. The parliament of the local communities came together and took the imam, trying to force him to change his mind. He sneaked back to the village, still holding on to Jesus Christ." Members of the radio station received threatening calls from Muslims upset about the conversions. "Tension was high and some staff went into hiding," he said, "but we kept on praying and praying and praising God. We kept this on a low key, so it would not turn into unrest." God gave them strength to persevere and members of the staff went to the village to help disciple the new converts. The cloud of fear and pain has dissipated now, but there is still an uneasy silence. The ministry's micro-enterprise, educational, health, water and other social economic development programs have helped build bridges with other Muslims, leading them to put their trust in Christ, said a representative from Christian Aid Mission, which assists the ministry. "Meeting real community needs opens the door for them to share the love of God on a personal level. It is so effective," he said. "They have erected public toilets and water fountains and given them to the city. They operate about 10 schools and feed thousands of children weekly." The ministry's social enterprises enable local evangelists to engage Muslims daily. Among micro-enterprise projects, one lends small amounts of cash to women so they can develop sustainable businesses to help take care of their families' needs. "This is the most forward-thinking missionary group that I have had the opportunity to engage in my life," the Christian Aid Mission representative said. "The local director believes that there is dignity in work, and that every person deserves the opportunity to earn their own way. They have many projects on the drawing board, and even more in mind for the future, as God allows. His motto: Africans helping Africans to do missions in Africa." Two other Muslims, strong young men, have since called the radio station from another area and given their lives to Christ. They, too, are undergoing severe persecution. "In spite of all the problems we face here, the Lord is calling His own, through our struggles and weak position, to His glory," the indigenous ministry director said. "Pray for the Lord to give us wisdom and boldness to continue with our work, and that the Lord would provide the needed resources to run the radio station."